OAXACA, Mexico, September 29, 2010 (ENS) – A landslide at dawn Tuesday buried four homes in a rural town in the state of Oaxaca in southern Mexico. Officials now say four people died in the incident in Santa Maria Tlahuitoltepec, a hill town of about 9,000 residents, and 11 others are still missing. On Tuesday morning, Oaxaca Governor Ulises Ruiz told local media that up to 1,000 people may have been killed by the slide. Ruiz now says he does not regret sounding the alarm that started a national rescue operation. Mexico’s Secretary of Interior Jose Francisco Blake Mora activated the National Civil Protecion System and ordered soldiers, marines and police as well as civil defense workers to the town. But they only got as far as a staging area in Mexico City. Bad weather made it difficult for emergency teams to reach the site of the landslide, about four hours by road from the state capital of Oaxaca. Over the past week, smaller landslides touched off by heavy rains have blocked roads into the area. Communications and power lines are down, which led to the misunderstanding. Heavy rains loosened the soil causing the slide that covered Santa Maria Tlahuitoltepec homes where people were still asleep in their beds. 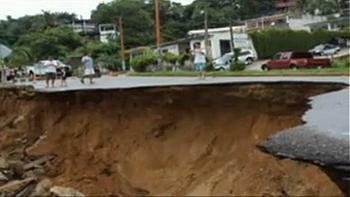 Hurricanes and tropical storms over the past two weeks have dumped heavy rains on southern Mexico and Central America. Most recently, Tropical Storm Matthew struck eastern Nicaragua Friday pounding the area with torrential rain and powerful winds. On Friday, Nicaragua evacuated some 10,000 people from Cabo Gracias a Dios and the Miskito Cays. On the weekend Matthew moved northwestward, pounding Belize and Guatemala with major flooding, deadly landslides and strong gusty winds. By Sunday, Matthew was a tropical depression unleashing flooding rainfall over southern Mexico. Many areas across the states of Oaxaca, Chiapas, Tabasco, and southern Veracruz reported three to six inches of rain Sunday. In Mexico’s southernmost state of Chiapas, three people were killed Sunday when their house collapsed under pounding rains. Elsewhere in Chiapas, landslides were reported in eight towns, including in Yajalon where 215 homes were damaged and some 1,000 families were forced into shelters.